The police officer is in stable condition in hospital. Calgary police officers stand at the scene of a shooting on March 27, 2018. CALGARY — A Calgary police officer was in hospital Tuesday after being shot by an armed suspect in the city's northeast. Kaminski said he could not reveal the officer's identity. 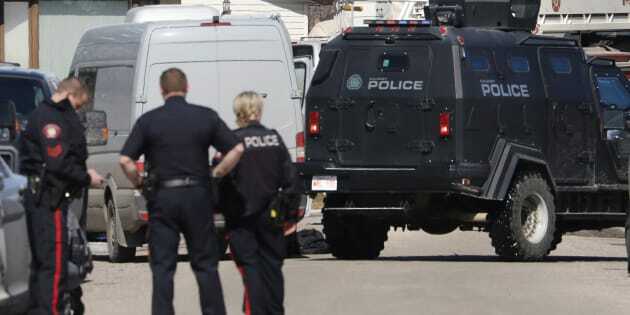 Calgary police tactical team members at the shooting scene of a police officer in Calgary on March 27, 2018. "No further information is available at this time,'' it posted on Twitter. Police initially called it an "active situation'' involving a firearm and advised people in the neighbourhood to stay in their homes. That order was lifted later in the day.